The nail tech behind The Nailscape, Ashley Gregory, has now added clothing designer to her list of many talents. The nail tech behind The Nailscape, Ashley Gregory, has now added clothing designer to her list of many talents. “The idea came when I was on set. The art director was asking the photographer and model to try more shots where the model had her hands in the shot. He said, ‘Can we get the hands in the shot?’ and I said ‘I’m going to put that on a T-shirt!’” Lately Gregory has been drawn to plain T-shirts with amusing sayings that she can wear to shoots. 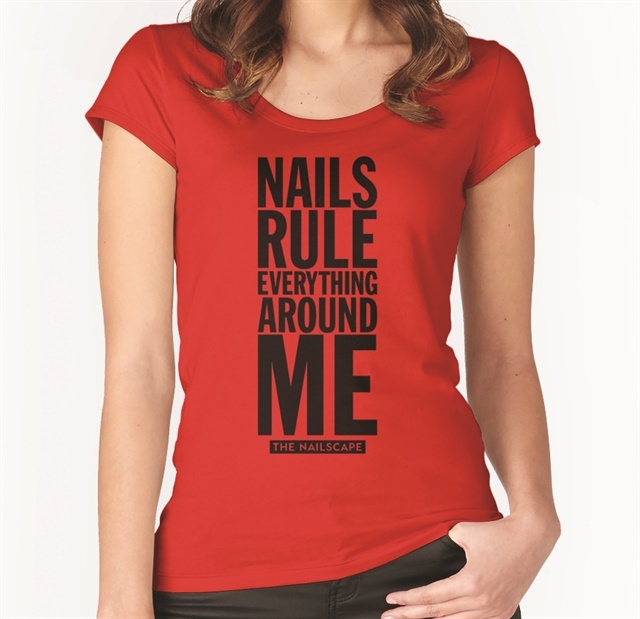 However, she noticed there was a lack of fun apparel for nail techs. Gregory commissioned a local graphic artist to take care of the technical stuff and The Nailscape started by releasing four designs with more to come. “The sayings are meant to elicit a response. I want them to be a conversation starter, and put it out there that we’re nail techs and proud, while still giving everyone a giggle,” says Gregory.